Be sure to read the article on the site or in the Forza Hub app for full details. Highlights below. This past Wednesday will live in my memory for a long time. Soon after we launched the August update for Forza Motorsport 7, myself and others around Turn 10 watched the Forza community light up with tweets, videos, streams and more, all reacting to the new features that arrived in the game. Today’s Week in Review comes on the heels of one of the biggest updates in Forza history, so let’s break it down! "Now, players can upgrade any car in the game with a new drift suspension, allowing some extreme steering angle, which is completely tunable by the player." Updated track limits are a first step in implementing the Forza Race Regulations system, which is still under development. We introduced Track Limits first for a reason; to give players time to learn the new definition of “clean” laps across all tracks, with no threat of penalty (beyond the track being labeled “dirty). Expect to hear more about Forza Race Regulations in the coming months as we get closer to its release." As a reminder, the Formula Drift Car Pack is available to players who digitally pre-order Forza Horizon 4, and the cars will be delivered in both Horizon 4 (at launch) and Forza Motorsport 7 (this fall). "Alongside the August update, we’ve introduced a number of new multiplayer hoppers to Forza Motorsport 7, designed to give new players a gentle introduction into the world of online multiplayer in the game. Here’s a look at these new hoppers"
"And if you were paying close attention to our August Update Release Notes, you noticed that we fixed an annoying issue in the ABCS multiplayer hopper where players would stay in the same class race after race." "In addition to events with cars on the line, we’ve got a couple of new events with some large amounts of credits available as rewards. With cars being unlocked in July, the goal is to give players more credits to work with in the game so they can drive the cars they want." "A new League Season starts this weekend! The “Hard Charging” season begins in Series 1 with a fun set of events featuring cars from the Sport Compact and Open-Wheel Legends divisions, and more." "We’ll be kicking off the show a bit later than usual, at around 4 p.m. Pacific. With that in mind, we’ll extend a bit beyond our normal stopping time of 5 p.m. and I hope you can join me for our weekly wrap-up show on the official Forza Mixer channel. See you then!" #WheelAndPedalWeds livestream at 10am Pacific? Biweekly Division and Tag Hopper rotation? We are aware player's are not seeing the option to redeem their Forza Rewards for this week. We are currently investigating this. New weekly challenges offer the Dodge Dart, Think Pink Driver Gear, and Lamborghini Aventador '12. "Join us for another edition of #ForzaFriday today as we continue to hit the ABCS multiplayer lobby and maybe even check out a Time Attack event or two. The show begins at 3 p.m. Pacific on Twitch and Mixer, so be there!" "We’ll have details on our August Bounty Hunter right here in the Week in Review next Friday. " See also the Contests/Gifts thread for current reward opportunities. Compete against T10 staff Shay (GT: spartyyon), Kari (GT: SpiderGoggles) Aaron (GT: Euro Nation), and Brian (GT: Mechberg) on the ForzaRC Rivals event leaderboard. Beating each target earns a reward, including credits, Ferrari 430 Scuderia, Lamborghini Aventador, Zenvo TS1, Saleen S7, Nissan #23 GT-R LM, Firefighter suit, and Tuxedo suit. "Our latest Turn 10 Bounty Hunter will be on through August and into September, and we’ll be keeping the community up to date with lap times as we go. Happy hot-lapping!" Earn the 2010 Audi TT RS Coupe, 2012 Dodge Challenger, and Vicious Driver gear through August 31. Events in Ghost Nostalgic Drag Racers, Sport GT, 1957 Maserati 300 S, and Drift Ghost RWD through September 1. "That’s it for this week. Don’t miss today’s #ForzaFriday livestream kicking off today at 3 p.m. Pacific for the start of our August Bounty Hunter event. See you then!" Supercars will launch its second e-Series at this weekend’s Melbourne Esports Open, with Boost Mobile as naming-rights partner for 2018. The Boost Mobile Supercars e-Series will consist of a six-round fight across October and November to crown Australia’s best racer on Xbox’s Forza Motorsport 7. Running from October 16 to November 21, the e-Series will be broadcast live on Supercars.com and across Supercars social media channels, including the gaming-focused streaming platform Twitch. A separate Cup Series is open to anyone on six nominated days in an online knockout competition. Supercars drivers will take part in this competition, running from October 15 to November 20, as phantom entrants. There will be a wide range of prizes in both the e-Series and Cup Series including a $5,000 cash prize pool, money-can’t-buy Supercars experiences, gaming products and merchandise. showing off "all the cool stuff coming to Forza Motorsport 7 with our September update." "This weekend Xbox Live Gold members everywhere will get the chance to play Forza Motorsport 7 for free as part of Xbox Free Play Days weekend." Complete a race in any mode to earn 1 million in game credits this weekend only. New weekly challenges offer the 2012 C63 AMG Coupe, Spa Day Driver Gear, and 1955 300 SLR. "The August Bounty Hunter event will be running well into September, so don’t miss your chance to get your time in and earn some great rewards once the event is done. " "Naturally we’ll also be diving deep into the September update for Forza Motorsport 7, which launches on Tuesday, September 11. We’ll also be giving viewers on Mixer and Twitch the chance to vote between four groups of cars; the winning group will be put into the Forza 7 Specialty Dealer after the show is done, and each car will be sold at a massive credit discount." Tickets for spectators: "Of course you’ll be able to watch all of the action on watch.forzarc.com as well as on the ForzaRC Twitch and Mixer channels but this time there’s a twist. If you’ve ever wanted to catch the ForzaRC action up close and personal, the World Championships are your chance. If you’re in the London area, you can join the team onsite and watch the competition unfold all weekend long. Tickets are now on sale. For more information about the onsite event and to purchase tickets, please visit ForzaRWC.eventbrite.com"
Check out #ForzaFriday today where we’ll be talking about the Forza Horizon 4 news and looking ahead to Forza Monthly. The show begins at 3 p.m. Pacific on Mixer and Twitch, so don’t miss it! "We also went deep on the Forza Motorsport 7 update and hinted at some of the things to come in the coming months. Don’t miss the replay here and look for news on our October show soon." "Meetups and Experimental Drag are two of the big highlights of this update." With the latest update, we also debuted Experimental Drag, which is currently available in Free Play mode only." "If you’ve tried out Experimental Drag and you’ve got something to say, let us hear it in the Forza Forums." "This week the Forza Racing Championship welcomed some special guests to the studio for the Series 2 Recap broadcasts. Team F4H was in the spotlight, with F4H Diablo, F4H Sterilizer and F4H REVZ on hand to drive in some fun team events like Picks & Bans and Oddball races." "Create your best 2010s-themed work of art and let us see it. Your hard work could be showcased during the ForzaRC Series 2 Playoffs broadcasts and, in addition, winning creators will receive 1 million in-game credits in Forza Motorsport 7, their choice of any non-DLC car in the game, and more. "We’ll be recapping all of it in today’s edition of #ForzaFriday, starting at 3 p.m. Pacific. Come hang out with us on Twitch and Mixer." "small update for Forza Motorsport 7 earlier this week (1.142.2737.0) that fixes an issue where leaderboard replays and Rivals ghosts would not load properly. To keep up with all the Forza Motorsport 7 Release Notes to date, check out the dedicated forum thread." "The current “Turn 10 Returns” Bounty Hunter event ends on Monday, September 24 at 5 p.m. Pacific. " "Join us today for our #ForzaFriday broadcast where we’ll be welcoming our Turn 10 competitors back for one final go-round on Spa to see if they can improve their times. The final times will be locked for Turn 10 folks after the show, so everyone in the community will know the targets to beat." "We are officially eight days away from the Series 2 ForzaRC Playoffs in Mexico City. Dozens of the world’s best Forza drivers have been competing all series long to be part of the Series 2 competition and it all comes to a head on September 29 and 30 with the Playoffs. 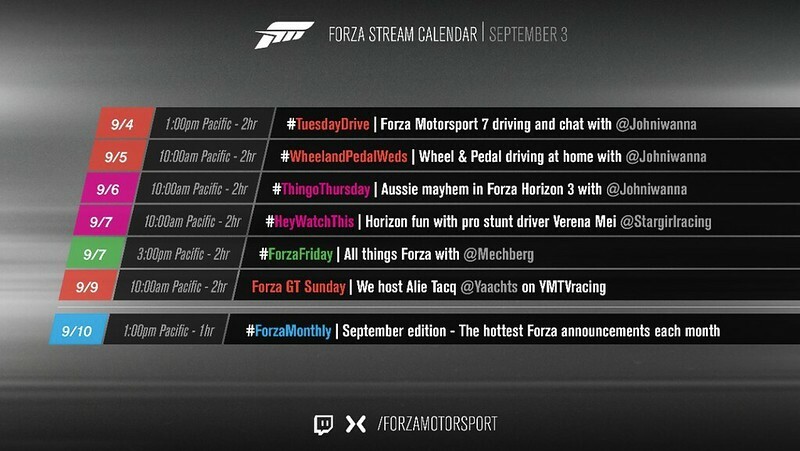 We’ll be bringing you live coverage of both days of competition over at watch.forzarc.com and you can look forward to a special pre-game show this coming Wednesday, September 26 at 12 p.m. Pacific, where Scott Cole, Alie Tacq, and Kate Osborne will catch you up on the latest and get you ready for the epic racing to come." "I’ll be back in Seattle just in time for our October edition of Forza Monthly, which will air on Wednesday, October 3. We’ll be celebrating the launch of Forza Horizon 4, looking ahead to the ForzaRC World Championships, and, of course, looking at the latest update for Forza Motorsport 7." The October update for Forza Motorsport 7 arrives on Tuesday, October 2! With this month’s update we’ve focused on numerous behind-the-scenes improvements to the game, as well as setting the stage for some important updates to come in the near future. In addition, we’ve got a brand-new Spotlight Car arriving at no additional charge for all Forza Motorsport 7 players, as well as the launch of the Formula Drift Car Pack. "Want to know more about the Forza Racing World Championship? Tune in to http://Watch.ForzaRC.com for exciting announcements, interviews and prizes! Happening now!" "We are officially eight days away from the culmination of the 2018 Forza Racing Championship season! 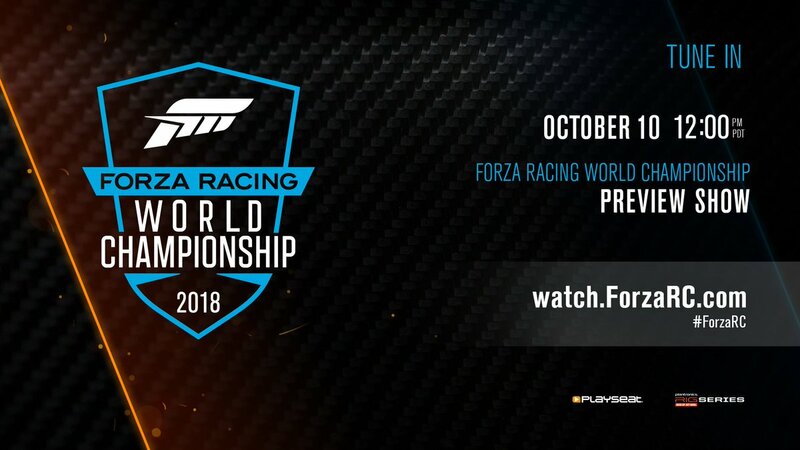 The ForzaRC World Championships are October 20 and 21 and we’ll be there to bring you all the action at watch.forzarc.com. Before we head to London though, the ForzaRC crew put together a special preview show, featuring familiar faces, including drivers like Noble b0x, JSR Commando, Sauber Zoom! Hear what the ForzaRC drivers have to say ahead of the big showdown in London, and be sure to tune in for all the action starting next Saturday and Sunday! Whether you’re watching online or heading to the GFinity Arena in person, we’ll see you on the track." "We’re making a small adjustment to today’s edition of #ForzaFriday. We’ll be kicking off the show one hour later than normal – at around 4 p.m. Pacific and ending at 6 p.m. Pacific. In addition to spending some time in the snowy expanses of Forza Horizon 4’s winter time, we’ll be playing Forza Motorsport 7 and celebrating the 100th running of the Random Ring Race. Join us on Mixer and Twitch for this #ForzaFriday tradition as we start the march to 200 Nürburgring Races in random vehicles." 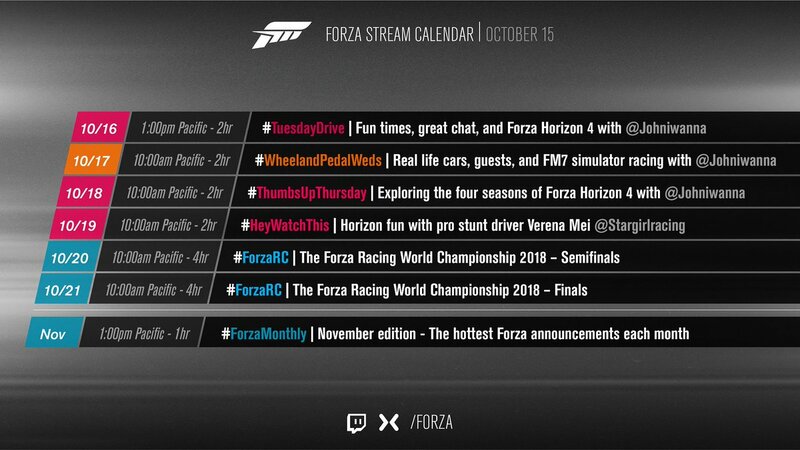 "Note that we will not have an edition of #ForzaFriday on October 19, as we’ll be preparing for the ForzaRC World Finals broadcasts. We’ll be back for more #ForzaFriday fun on October 26!" "...Not only is there the title of World Champion on the line, but all 24 racers competing this weekend are racing for serious money – with a prize pool totaling $100,000. The action kicks off tomorrow at 10 a.m. Pacific/6 p.m. in the U.K. and you can watch it all at http://watch.forzarc.com." "Later today, you can join Johniwanna as he kicks off a special edition of #ForzaFriday at 3 p.m. Pacific over on the official Forza Mixer and Twitch channels. See you then, and see you this weekend for the ForzaRC World Championships!"